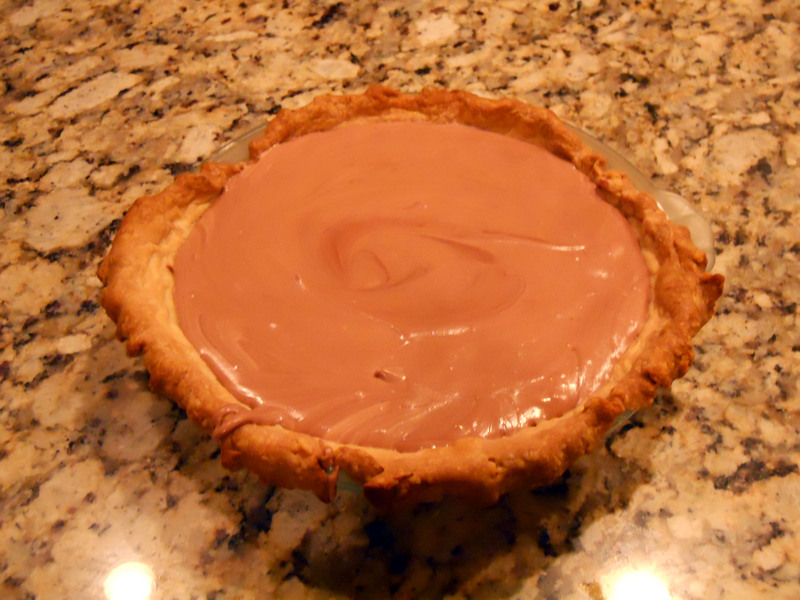 Glass of Fancy » Blog Archive » Let’s Lunch: Chocolate Pie - Fashion, fiction, and life in the city. In the top of a double boiler, combine milk, chocolate, and salt. Cook over hot water, stirring continually, until very thick. Gradually add water, stirring to keep mixture smooth, then cook 2 to 5 minutes until mixture thickens again. Remove from heat. Stir in vanilla, and chill until cold. Fold into whipped cream. Pour into pastry shell, and chill at least 4 hours to set. In a small bowl, add the salt to the water and stir to dissolve. Put the flour in the work bowl of a food processor. Cut the butter into 1-inch pieces and scatter the pieces over the flour. Pulse briefly until the mixture forms large crumbs and some of the butter is still in pieces the size of peas. Add the water and salt mixture and pulse for several seconds until the dough begins to come together in a ball but is not completely smooth. You should still be able to see some butter chunks. Form dough into a ball then pat into a disc 1″ thick and chill at least 2 hours. Roll out into pie dish, then chill or freeze until firm to the touch. Bake at 375 F with pie weights until the surface looks light brown, about 25 minutes; to check, lift a corner of the paper. Remove from the oven and remove the weights and paper. Return to the oven and bake until golden brown, about 5 minutes longer. Let cool completely before filling. Herb Pie from Ottelenghi and Tamimi’s Jerusalem at Three Clever Sisters. Sweet Potato Custard Pie at A Cook and Her Books. Sweet Ricotta Noodle Pie at Monday Morning Cooking Club. Biscoff Banana and Pear Galette at Spicebox Travels. Mexican Cottage Pie at A Tiger in the Kitchen. Calamansi Pie at Asian in America. Cushaw Pie at Tea and Scones, Too. Edna Lewis’ Tyler Pie from Nancy McDermott. Huckleberry Pie Ice Cream at The Gastro Gnome. Apple Pie Sandwiches at Sandwich Surprise. This entry was posted on Friday, September 13th, 2013 at 12:35 pm	and is filed under Manna. You can follow any responses to this entry through the RSS 2.0 feed. You can leave a response, or trackback from your own site. CHOCOLATE!! Cannot get much better than that! I’ve never made a chocolate pie before. But now that I see that picture, I see… wow, a puddle of chocolate that I can practically climb into! I think this will work for me 🙂 Thanks so much for sharing your recipe! I would put condensed milk in just about everything if I could. Thanks for sharing this velvety looking sweet treat! Chocolate is the best! It surprises me that Rebecca has never made a chocolate pie. How could anyone live like that?! This chocolate pie recipe is calling my name ~ thanks for the enabling! Chocolate, condensed milk, on a Tartine crust? Perfection! If there’s chocolate in this, then I go weak in the knees. This looks like a delish pie and very easy to make. Thanks for sharing the Chocolate Pie recipe. Nice to meet via #LetsLunch and thanks for the mention in your round-up! I find it also works very well with a crumb crust made with thin chocolate wafers. If some chocolate is good, more has to be better, right?